When I leave comments on other blogger’s posts I like to be notified on any new comments that are posted. Maybe it is just me? But comments by other readers and response(s) by the blogger help my learning. Being notified of follow up comments means I can choose to continue the conversation by returning to the post to add further comments — this makes me a more effective blogger. Needless to say, after 18 months of tracking comments, I’m ‘quite’ good at it. There are several comment tracking services that allow you to subscribe to new commenting by RSS using your feed reader. RSS is always my preferred choice when available because it makes my life easier. I was using co.mments and cocomment but co.mments was discontinuing their services and shut down as of today! Here is my detailed post on how to keep track on of new comments on other bloggers’ posts using cocomment. One definite benefit of cocomment is if your comment is accidentally lost and you can normally find a copy of what you’ve written in your cocomment account e.g. your comment failed to post due to problems with the anti-spam word. I’m now also using Commentful which is okay, as a backup, but doesn’t give me the type of RSS feed I like. 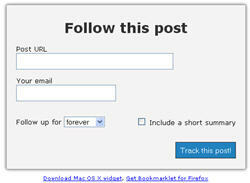 There are several options if you prefer email to RSS. 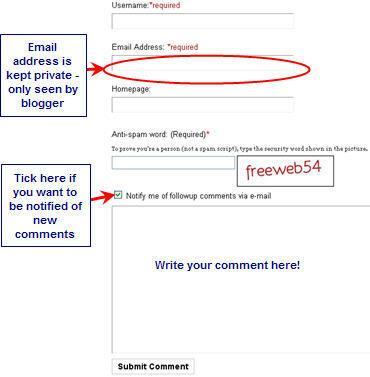 Some bloggers use the Subscribe to Comments plugin which allows readers to select ‘ Notify me of followup comments via e-mail ‘ when they write comments. This means each time a new comment is posted you will recieve an email. Both comment tracking services provide the ability to track comments by email. People often ask me how I’m able to respond quickly to comments on other bloggers posts. Hopefully this has answered those questions. Would love to hear your thoughts! Do you like to track comments on other bloggers posts? If so, what is your method(s)? What tips do you have for being more effective at tracking comments? This was part of the Day 8 Task for Building a Better Blog. Sue, I love the way your blog posts and tweets make me laugh out loud, often! Laughter is so good for the spirit, to get through the day(s)! Today, your “(quite) good” made me laugh! I agree with you that tracking followup comments to others’ blog posts is often rich source material for valuable reflection. I did not know about cocomment; I’m off to learn more about it now. @Holly glad both my posts and tweets make you laugh. Cocomment definitely has a steep learning curve to learn how to use compared to co.mments. But at the moment if you want RSS it is the best option. Don’t think I have added a post on how to add the notify option but I would recommend you use it. You will need to be an Edublogs supporter. Then go to plugin tab and click on activate next to Subscribe to Comments plugin. I had tried tracking posts manually in the past, which was not very fun! Yes tracking comments manually isn’t much fun, Matt. Sorry for slow response – have you now tried backtype and how are you finding it? Okay, I’m red-faced. I answered my own questions. I see, when I go to make a comment, the cocomment box appears at the bottom … it wasn’t there when I put my previous comment in, honest! Oh Marie, trust me I am the red faced person at the moment. Made changes to my account and didn’t realise the comments were being sent to the wrong email account – if we keep it quiet no one will know. Interesting post…thanks very much Sue. It’s definitely something to consider for our blog (www.shef.ac.uk/goodpractice). Our teachingcommons project (www.shef.ac.uk/teachingcommons) is about getting people together to talk about learning and teaching and we really want to get a bit more interactive on our blog comments – especially given that the blog aims to be a forum for exchanging good practice at the University! How can I add the “Subscribe to comments by email” option to a Blogger blog? Of course it is. It’s been there all along. And I thought I had to add something. Suddenly I feel really silly. Definitely don’t feel silly Natasa – I couldn’t think of the answer either and had to Google it. Once I found the answer I realised, like you, it was obvious. I bookmark the post where I left a comment and save it on my emapey’s comments Bookmarks on Delicious using the tag: comments. Tracking comments has become a huge headache for me. Co.mments was the best and made it really easy. Cocomments is good but often struggles to track the conversations well. Unfortunately I have now started using notify by email, where it is an option, to make the task easier. Not sure if delicious would help me as I want to know when a new comment is posted and respond to it if I choose. True and very good point. People can use Cocomment to see where I am commenting. Just wish co.mment hadn’t closed shop!